One of the oldest areas of Arnold, CA, this proud little community (a sign upon entrance declares: White Pines is NOT Arnold) is deeply tied to Arnolds logging roots. 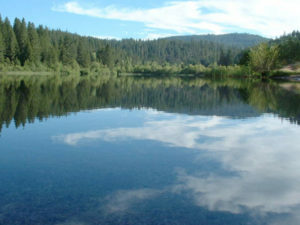 The community is also home to White Pines Lake and recreation area (which is maintained by donations and volunteers). Every year, eager fishermen compete in the annual father’s day fishing derby, hoping to snag a prized catch. Take a walk around the area and you’ll find Hazel Fischer Elementary School (a top rated school with terrific parental and community involvement), the Arnold Moose Lodge, and a lake side recreation area. Spend some time at the Arnold Logging Museum or catch the trail head of the Arnold Rim Trail for an adventurous hike or bike ride. Independence Hall hosts an annual flea market, year-round furniture sales, and serves as a meeting place for various community organizations. Homes in the area have plenty of yesteryear charm.